Malcolm X holds up a paper for the crowd to see during a rally in New York City on Aug. 6, 1963. AFRICANGLOBE – The “justice” system in America is set up in such a way as to punish Black Americans more than the Caucasian, to deny this racism is to deny reality. That was taken from a 2012 debate that aired on ABC News. Coincidentally, after Paul said this during the debate, he was not allowed more than 1-2 minutes of speaking time in the debates thereafter. Sadly, it seems, that if we look back over the past decades, there are far too many similarities to be found between the plight of one specific socioeconomic class of the 50’s, 60’s and 70’s, and that same socioeconomic class of today. Little has changed for the poor in America in the last 50 years, especially for the poor people who happen to have higher levels of melanin in their skin than their neighbor. Racism is a huge part of the problem, but it is important that we point out that it is only part of the problem. The other part of this problem is the color blue, and the violent unaccountable leviathan that it represents in America today. A racist idiot without a badge and uniform is simply a racist idiot, add the power of the state and that racist idiot lays waste to civil rights, initiates violence, and extorts the populace; all of this, with impunity. 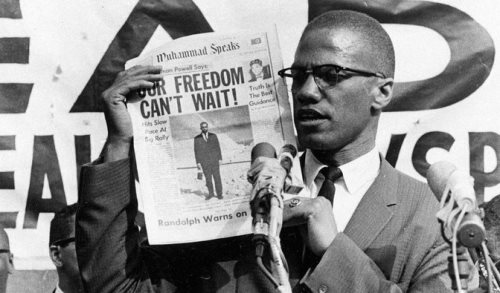 On June 8, 1964, Mike Wallace interviewed Malcolm X and they discussed the African American Harlem environment and the community’s hostility against policemen. During this interview, Malcolm X outlines this disproportionate targeting of the African American community by police, and why they do it. The interview starts out as Wallace asks Malcolm X about potential resistance against police oppression within the Black community. “Mr. Malcolm, you have suggested that there are all kinds of movements in Harlem that you or I don’t know about? Malcolm X eloquently and prophetically sums up the perplexity of this situation, not only during the 60’s, but in the 21st century as well. Forty-six police NYPD officers were killed in the line of duty in the 1970s, and 41 more in the 1980s. The last thing we need is a further increase in animosity between police and the citizens. Hopefully, police lighten their antagonistic stance and proceed with a more diplomatic approach. And hopefully, the next person on the verge of a killing spree realizes that violence only begets more violence. We’ve seen time and again that violently bashing heads together produces no desirable result. It’s time for a different approach. “One day we must come to see that peace is not merely a distant goal that we seek, but a means by which we arrive at that goal.” — Martin Luther King, Jr.